This week my company Cozi launched Cozi Central, a product that lets busy families communicate with each other and juggle the many elements of their lives at home. Among other things, our public launch means I can now cover my own user interface designs in this blog. I thought a good place to start this coverage was a quick look at what it means to design software for families. Most software products and services for the home market oddly do not, in fact, recognize the family dynamics that dominate home life. Consider any service with which the entire household has a single account, then see how many family members are allowed to administer that account. 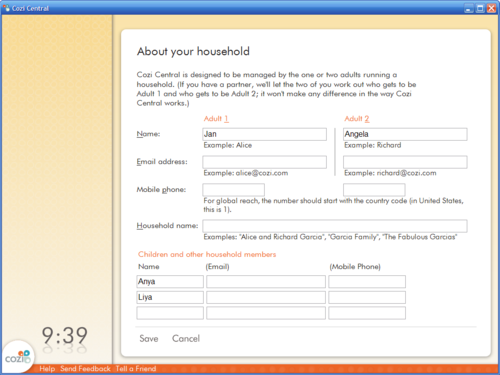 In most consumer products, the single person who signs up for a household account becomes the account’s sole administrator. They can add other family members to the account, but those other users are invariably treated as second class participants in the account. Many households have not one, but two people running the household. 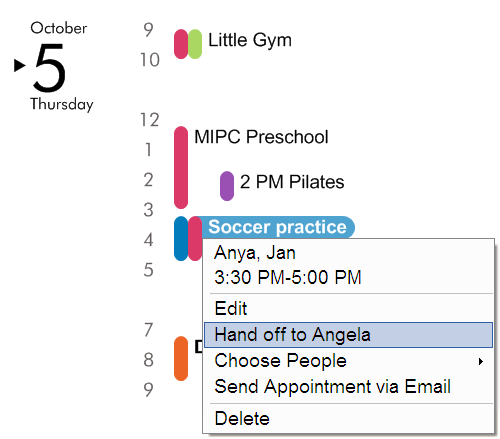 In these cases, the user model doesn’t match the household’s actual organization. If Mom ends up as the family’s account administrator, how does Dad feel asking her to reset his password? Or if Dad ends up as the account administrator, how does Mom feel asking him to give her access to a new feature? A poor design decision in the virtual world provokes awkward interactions between family members. We designed Cozi Central from the ground up for the dynamics of families, not small businesses. Either one OR two people can be identified as the adults running the household. There are, of course, numerous households with multiple adults, but in most of them, one or two people can be identified as running the household. For our v1.0, those edge cases weren't worth pursuing if they would cause the 90% case to suffer. Designing things this way does require a bit more design and development work. On the whole, however, the product’s model of family organization now more closely represents that of actual households, so it enables unique features that capitalize on family dynamics. You can see more examples of family-ready design in Cozi Central itself. 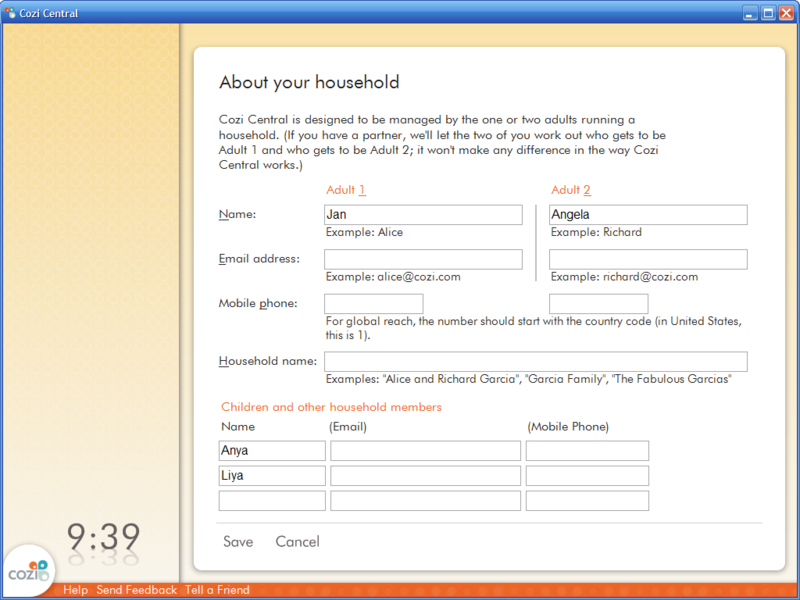 The product, which includes features to track family calendars, messages, and shopping lists, is available for free at http://www.cozi.com. The dialog is a smallish window that contains a very long scrolling text box. Below the text box sit controls with which the user must accept or decline the agreement. This may take the form of an "I agree" check box, or a set of push buttons (shown above). The user experience of reviewing a EULA in such a dialog is, of course, terrible. The text of the EULA itself is dense legal language fully of text INEXPLICABLY IN CAPITALS warning you that you hereby AGREE to ALL SORTS OF STUFF YOU DON"T UNDERSTAND. The text is not generally organized in any interesting way (e.g., important stuff first). The text is usually plain text or simply formatted and—profligate use of capitals to the contrary—does not actually highlight the most interesting bits in the text. The text goes on for pages and pages. In most cases, the application does not offer a default option. If it does, the default is nearly always to decline the agreement. Since the user is almost always going to accept the agreement anyway, the default option (if there is one) is essentially never the option the user wants. It's commonly held wisdom that most users blow through such dialogs as quickly as they can. Having paid for software, or at least having gone through the trouble to download it, are they really going to read the agreement carefully and Decline it? The effect of this is that users often end up agreeing to all sorts of things they'd probably not be comfortable with if they were aware of them. Here's the complete text of the EULA above, with highlighting around some ominous clause related to digital rights management. This EULA is even more daunting than it first appears: it's a supplemental EULA, amending another, probably equally lengthy EULA. In some cases, glossing over concerning details is exactly what the vendor had in mind. Still, there are many cases when the vendor probably would prefer that you really did know a fact that's unfortunately buried in the EULA. 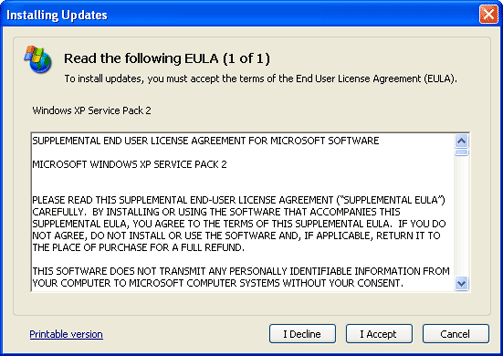 The EULA for many software products indicate that the license entitles the user to install the software on one computer. While there are many users who willingly ignore (or do their best to circumvent) such a restriction, there are surely others who would abide by this restriction—if only they were aware of it. Despite the obvious shortcomings with such a user interface, there are many, many very good reasons why vendors offer an interface just like this. One very good reason is that few vendors even give the UI a second thought. It's a standard part of most application Setup frameworks, so it's essentially free to use a framework-supplied EULA UI and it's not free to write something better. The company lawyers fill it in once and the dialog is forgotten forever. Another very good reason for using this interface is that everyone else uses it. Even if you tried to do something differently, your lawyers would probably tell you to cut it out. If a lawyer didn't stop you, there's always the small but nagging chance you could goof something up, and someone will have a good opportunity to successfully sue you. Most people don't think this is worth the trouble. I sat in on a number of early design reviews of the Microsoft Windows Vista Setup user experience, and asked whether we could do better than the dialog above. The Setup team loudly shouted, "NO! ", for essentially the reasons given above. A company like Microsoft is sued on a daily basis, and has probably paid for every word of its EULAs with bloody court battles they don't care to repeat. They would prefer not to expose themselves to new legal risk. 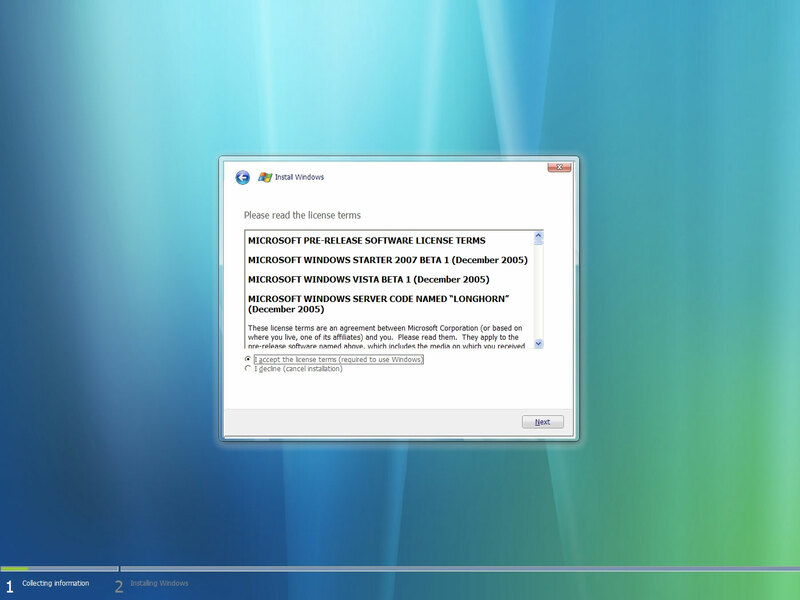 Accordingly, the Windows Vista EULA experience can dress up the dialog with glassy effects, but the experience remains essentially unchanged. I've spent the last few months at my startup, Cozi, preparing for the not-too-distant launch of our first product. I wanted to make another go at coming up with a better EULA user experience. We're fortunate enough to work with some forward-thinking lawyers who would at least entertain the idea of trying something new. Our final user interface is, for now, that of the canonical EULA dialog above. We rely on a third-party Setup framework, and ultimately decided we didn't have time to rewrite the framework's EULA dialog. However, we were able to introduce what I hope will prove to be an improvement in the user experience of trying to actually understand what the agreement says. NOTE: Those simple lines above and below the bullets are absolutely critical. The Bullet Summary is meant to summarize, not replace, the text of the agreement. I'm not a lawyer, but it's my understanding that offering the user a summary of a legal agreement can be acceptable as long as the summary is not misleading, is consistent with the complete agreement that follows, and does not imply that the summary is a complete account of what the user is agreeing to. The reaction to the use of a Bullet Summary in our EULA has been quite positive. Our lawyers thought it would be helpful. And, indeed, more than one beta tester has offered completely unprompted feedback saying they found the bullets helpful. If users actually notice what's going on in a EULA dialog during Setup, of all things, and then take the trouble to tell you they like it, something must be going right. In an on-site usability test, I watched one user who came to the EULA page. They reached immediately for the "I Agree" button—and then paused to read the bullets. It was my impression that this user would never have read anything in the EULA if they hadn't stopped to read the bullets. I, for one, am happier to have people use our products knowing that they are at least slightly better informed about what they've agreed to. And, finally, writing a Bullet Summary is a highly useful design exercise. It prompts a deep, reflective discussion among team members about which points in the agreement are actually the most important for their users to understand. It bears repeating that I'm not a lawyer. I'm offering this information about the products I work on because I think this idea helps make life marginally better for my company's customers. Indepent of whether you agree with the contents of Cozi's legal agreements, you may find the Bullet Summary approach interesting. If you are tempted to apply this idea to your own product, consult an attorney before proceeding. You may find it helpful to point them at this post and Cozi's site. With any luck, a user interface precedent—and a legal precedent— will be established that results in EULAs and other software-related legal agreements that are just a bit easier for the typical user to understand.